Fine Cooking has a great feature most months called "Cooking Without Recipes." Each features a different food like ice cream, potato salad, or fruit cobbler, and offers up a base recipe plus lots and lots of variations. You can go crazy and create your own combination, or use one of the suggested ingredient combos. Tim and I were inspired by the recent article on meatloaf, and thought the fennel-turkey meatloaf suggestion sounded terrific - and it was! This is definitely one of the best meatloafs I've ever had. The combination of fresh fennel and fennel seeds adds a complex and delicious - but not overpowering - fennel flavor to the meatloaf, and the method of soaking and then chopping bread cubes holds everything together really well. 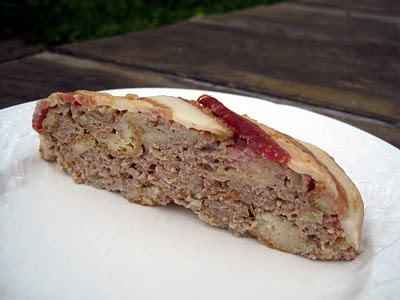 The idea of wrapping the meatloaf in bacon is genius - it keeps the meat moist despite using ground turkey, and adds fantastic flavor. This does make a large meatloaf, but the leftovers are just as good heated up in the microwave for a minute or so. You could also easily make a half recipe (mini-meatloaf!) since the loaf is formed by hand rather than being baked in a loaf pan. 1. Heat 1-2 T oil in a nonstick skillet over medium-low heat. Add the onion, fennel, and garlic, and saute, stirring frequently, until softened and just beginning to brown, about 8 minutes. 2. Add the white wine, and simmer briskly, until almost dry, 4 to 5 minutes. Transfer to a large bowl and let cool while preparing the remaining ingredients. 3. In a shallow dish that holds it in a single layer, soak the bread in the milk, flipping once, until soggy but not falling apart, 5-10 minutes. Lightly squeeze a handful of bread at a time to remove some of the milk (it should be wet but not drenched). Finely chop and add to the bowl with the onion mixture.4. Position a rack in the center of the oven and heat the oven to 375 degrees F.
5. Add the turkey and eggs to the onion mixture. Scatter the scallions, red pepper flakes, and fennel seeds over the meat, and then sprinkle with the Worcestershire, 2 tsp salt, and 1/2 tsp pepper. Use your hands to gently mix all the ingredients until just combined, being careful not to compact the mixture too much. 6. Set a non-stick pan over medium low heat, and form 1 T of the meatloaf mixture into a small patty (or use a bit of oil in a regular pan). Cook the patty on both sides until cooked through, about 5 minutes total. Taste and adjust for salt, pepper, and any other seasonings. 7. Line a 9x13-inch baking pan with parchment paper. Transfer the meatloaf mixture to the baking pan and form into a 10x4-inch rectangular block (it becomes loaf-shaped as it cooks). Finish the meatloaf by draping it with strips of bacon on the diagonal. 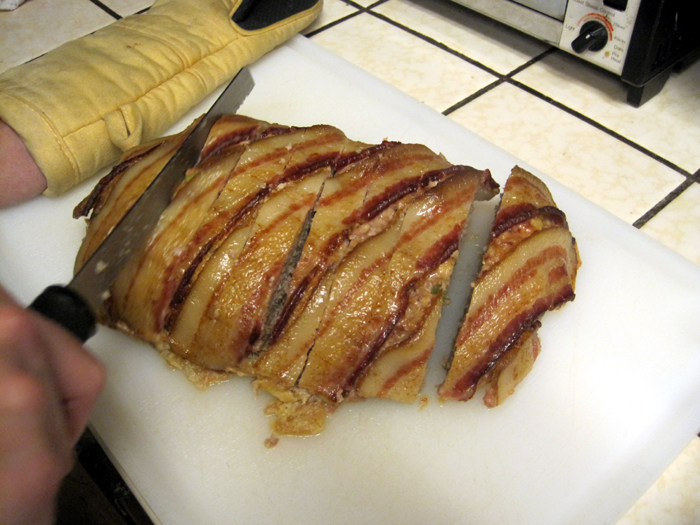 Trim the bacon with kitchen scissors to fit, and use extra trimmings to cover the ends. 8. Bake until an instant-read thermometer registers 165 degrees F in the center of the meatloaf, 40 to 55 minutes. Then broil the meatloaf about 6 inches from the broiler (or turn the oven up to 500 degrees and return the meatloaf to the oven on the top shelf), until the bacon is brown and crisped, about 3 minutes. I'm a big fan of Blogger Secret Ingredient, which features a different surprise ingredient every week. 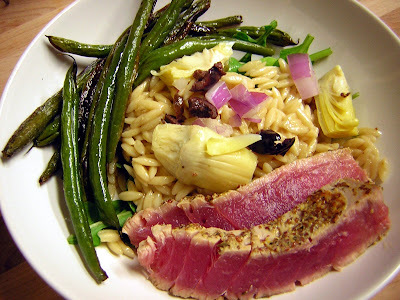 So, it was lots of fun to host this week, with the secret ingredient of green beans! 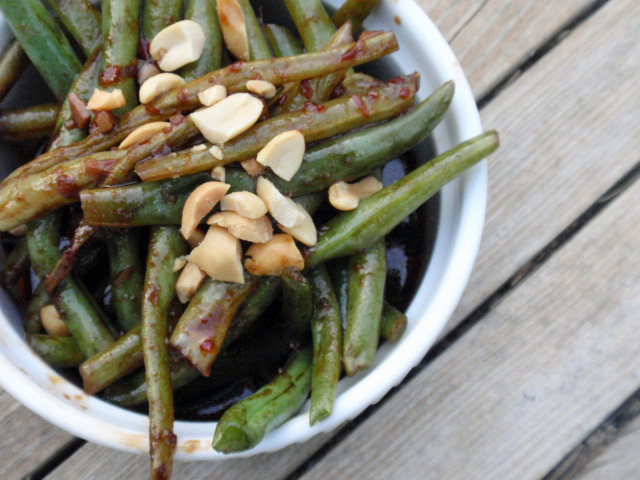 Check out all the awesome green bean recipes below. 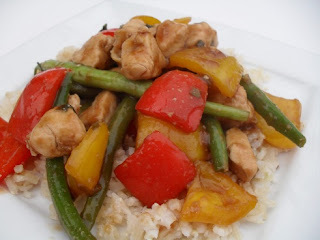 I also selected my favorite recipe of the week to receive a small prize...congrats to Janet of the taste space! Your salad has such a great combination of color, flavor and crunch that I couldn't resist it! Send your contact info my way and a little surprise will be arriving in your mailbox very soon! 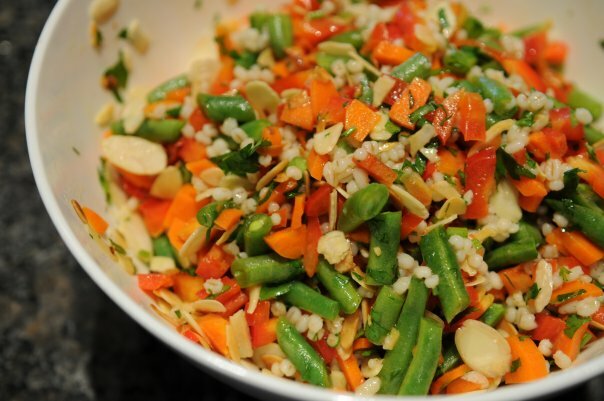 French Barley Salad with Carrots, Green Beans, Red Peppers and Almonds from the taste space! Check out next week's BSI at the Balanced Broad! OMG, guys, you need to go make this recipe right away! This week's French Fridays with Dorie recipe couldn't be easier - and I can't lie, I changed Dorie's recipe a bit to make it even more streamlined. 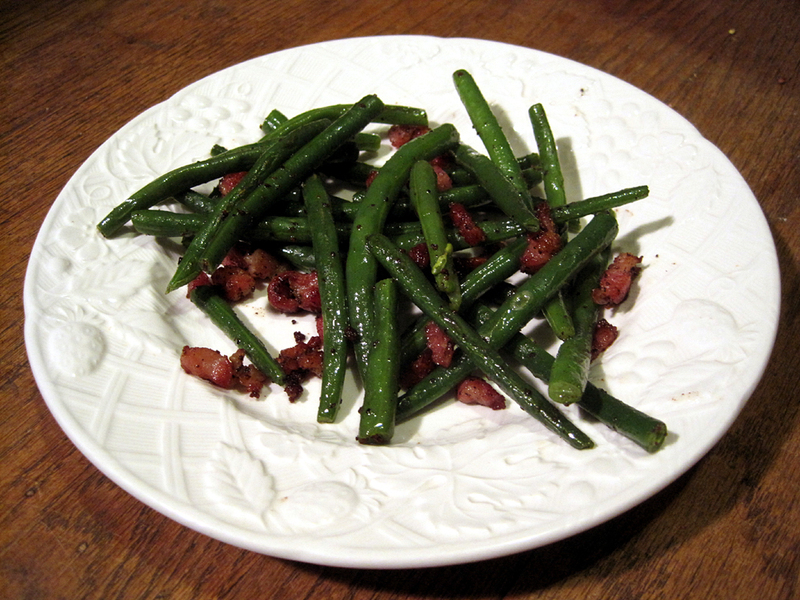 Boil some green beans, saute some pancetta in butter, and dump the beans into the pancetta. Saute a couple minutes, and you've got a fantastic dish! I used this amazing pepper pancetta that the woman at the meats counter recommended, and it was wonderful with the beans - definitely go for that if it's an option at your store! The only other suggestion I have about this dish is to try to get thickly sliced pancetta that you can cut up into little cubes, rather than paper-thin slices - while those are perfectly yummy in their own way, I think this dish calls for something a little meatier and chewier, which the bigger pieces provide. In a pinch, thickly-sliced pepper bacon would also be great (although probably less French!). Don't forget to submit your green bean recipes to this week's Blogger Secret Ingredient: Green Beans! You can choose something you've posted about this week (I'm sure a lot of you have your interpretation of this very recipes!) 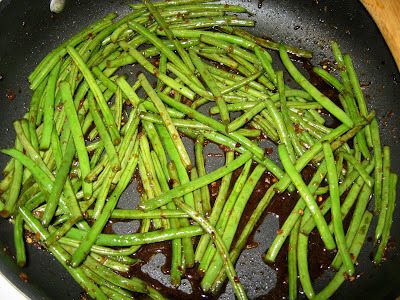 or anything green-bean-related from your blog archives. 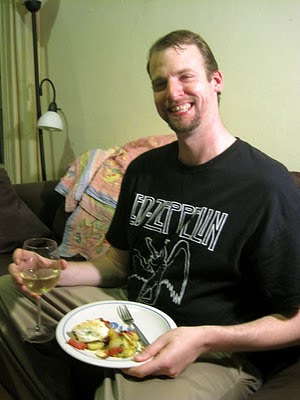 Tim and I decided to make dinner together for Valentine's Day. We picked out a really yummy halibut recipe that's easy to make but definitely feels perfect for a special occasion. 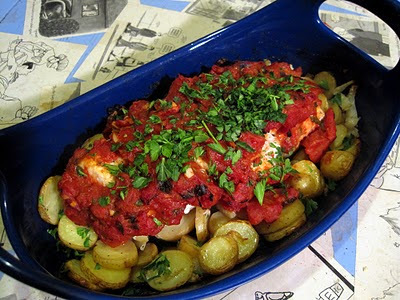 Potatoes and fennel get roasted in the oven while an easy tomato sauce simmers on the stove - with orange zest as the secret ingredient that sounds unusual but is actually really tasty. When the fish is layered in between the various veggies, it creates an excellent one-dish meal (well, two if you count the skillet for the sauce - but still, low on the cleanup!). Along with homemade heart-shaped sugar cookies, Roxbury Road ice cream, and chocolate-covered gummy bears, it was the perfect Valentine's Day dinner! 1. Preheat oven to 450 degrees. Toss the potatoes and fennel with enough olive oil to lightly coat and season with salt and pepper. Bake 30 minutes, or until the potatoes are almost tender. 2. Heat about 1/2 tsp olive oil in a skillet over medium heat. Add the fennel seeds and garlic, and saute for one minute. Add the wine, half the parsley, the orange zest, oregano, and tomatoes, and season with salt and pepper. Bring to a boil and then reduce heat and simmer for 8-10 minutes. 3. Season the fish with salt and pepper. 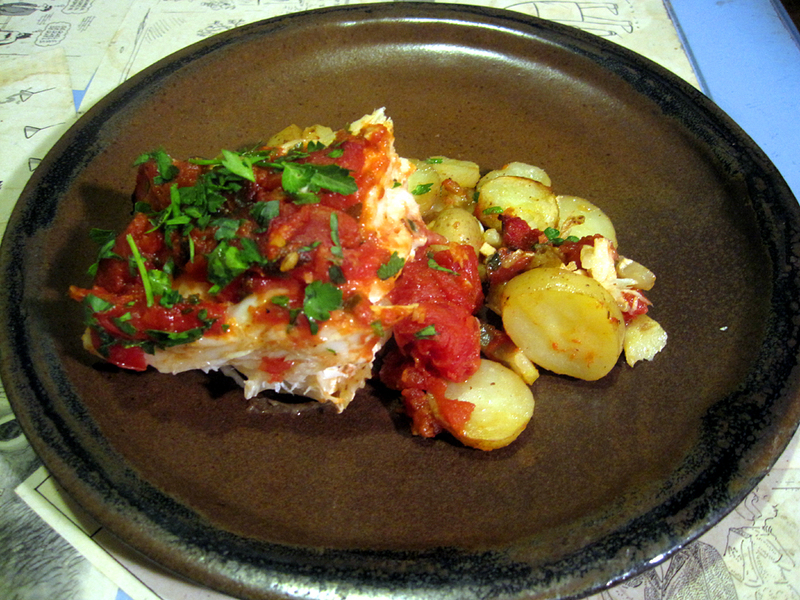 Place on top of the potato mixture and then spread the tomato sauce over the fish. Return the pan to the oven and bake for 20 more minutes until the fish flakes easily. Sprinkle with the remaining parsley. Blogger Secret Ingredient is a fun blog event that features a different surprise ingredient every week. This week, I've chosen green beans as the "secret" ingredient. Send along your blog post featuring your favorite green bean recipe - either new or old (archived posts are okay!) - to my email, cutesybuttons -at- gmail -dot- com. Feel free to attach a picture if you have one, and I'll post that along with the round up next Monday. If you don't have a blog, you can still join in the fun - send me your recipe (and photo, if you like), and I'll add it to the round up. 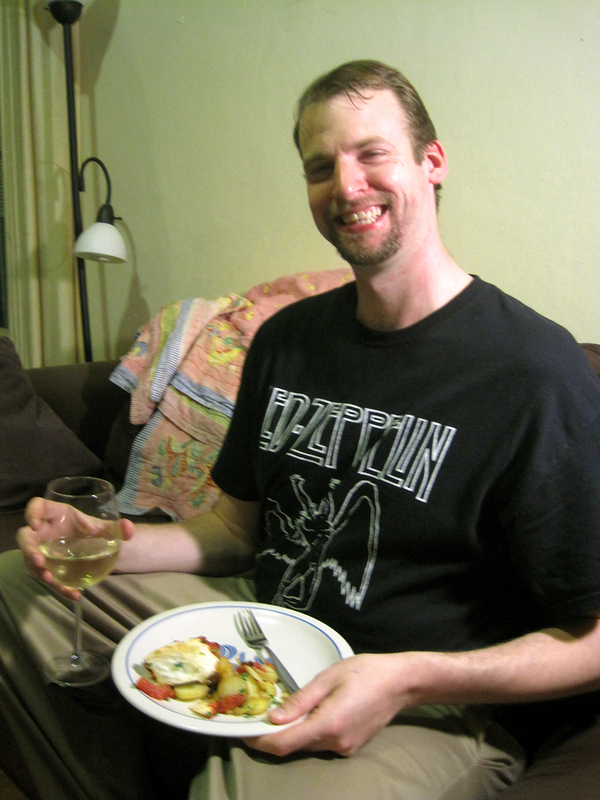 Please get me your links, photos, and/or recipes by noon Pacific time on Sunday, January 20. Make sure to leave a link to this blog, as well as a link to the BSI rules and previous hosts, in your post. On Monday, I'll also choose my favorite recipe and send a special little surprise prize your way! Also, please let me know if you're interested in choosing the next secret ingredient and hosting next week! Check out last week's host Around my Family Table! I made this beef stew a long time ago, but never got the post up on the blog. I do remember it being really yummy, so I'm happy to share it now. 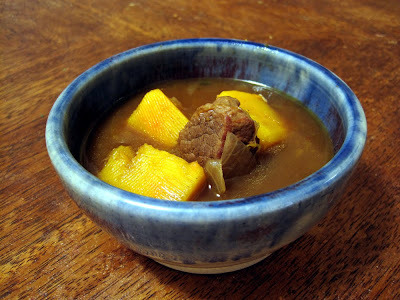 Here's what I wrote about it way back when: This beef stew is has an interesting (and tasty!) twist because it replaces the usual carrots and potatoes with winter squash. We used banana squash, but butternut, kabocha, or any other favorite winter squash would work well here. 1. Heat the oil in a large soup pot over medium heat. Add the onion, garlic, rosemary, and thyme and saute until the onion is softened, about 4 minutes. 2. Combine the salt, pepper, and flour in a medium bowl. Add the beef cubes and toss to coat. Turn up the heat under the soup to medium-heat and add the beef. Cook until the beef is browned and golden around teh edges, 5 minutes. 3. Add the Marsala and use a wooden spoon to scrape all the brown bits off the bottom of the pan. Add the squash and sun dried tomatoes and stir to combine. Add the beef broth, bring to a boil, lower heat to low, cover, and simmer for 1 hour. Season with salt and pepper to taste. This vegetarian dish is super easy and cheap to make, but it's also really delicious. 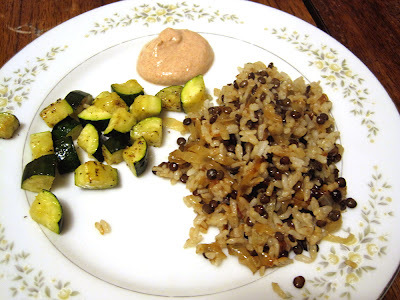 I do suggest splurging to get the French lentils the recipe calls for - overall, the dish is still very inexpensive, and they're so much tastier than regular brown lentils, at least in my opinion! This is one of those dishes that's nothing special right when you make it, but once the flavors have the chance to combine it becomes wonderful. So, make sure to prepare it ahead so it has time to rest in the fridge for at least a few hours before you serve it. Since mujaddara only gets better over time, it's a great candidate for making a big portion over the weekend and packing for lunch. It's especially good with the spiced yogurt on the side. The flavor of the yogurt is somewhat strong on its own, but don't be scared - it's very yummy mixed into the rice and lentils. 1. Put the lentils and 2 cups water in a pot along with about 1/4 tsp salt. Bring to a boil, and then lower to a simmer and cook about 20 minutes, until the lentils are tender but not mushy. 2. Melt the butter and olive oil in a non-stick skillet or large nonstick Dutch oven over medium heat. Add the onions and stir frequently until they soften and release their liquid. Sprinkle with salt, and then continue cooking for about 10 minutes, until the onions are very browned and softened. When the onions are nicely browned, turn the heat up to high, adding a bit more oil if needed, and cook, stirring infrequently, until the bottom layer of onions becomes a bit crispy. 3. Stir together the lentils, onions, and rice, adjusting the amount of rice you use for the balance of rice-to-lentils that you prefer. Let cool slightly, then cover and chill for at least a few hours. 4. Reheat the mujaddara in a low oven or the microwave before serving. 5. To serve, stir all the yogurt ingredients together. Taste and add more yogurt or spices as needed, and serve alongside the mujaddara. 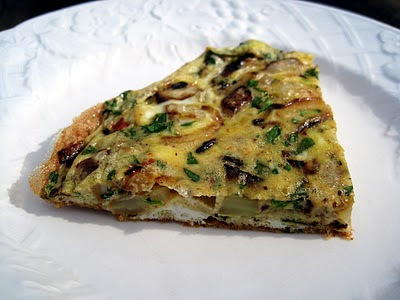 This week's French Fridays with Dorie recipe was the Basque Potato Tortilla. I was whipping up a quick lunch today and didn't have time to run to the store, which is why you won't see the word "potato" up there in the title of this post! Instead, I decided to use up some other veggies in the fridge that really needed to be cooked before they went bad. I sauteed some thinly sliced onion, garlic, and diced fennel in oil until soft and pretty darn browned (I like my onions really dark! ), and then combined that with some eggs, smoked paprika, and cilantro. (Side note: why do they sell cilantro in such large quantities? I'm never able to use it all up!) This all got poured back into the pan, cooked on the stovetop for a few minutes, and then popped in a 350 degree oven until the egg was cooked through. I wasn't sure about the combination of fennel and cilantro - it was more a marriage of convenience than of "wow, these would sure taste amazing together! ", but actually it worked well. The flavors didn't clash, and the cilantro added a nice pop of green to an otherwise monochromatic dish. 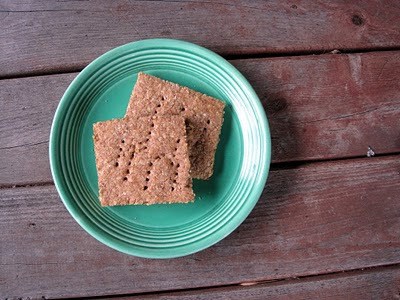 Making your own graham crackers is as easy as making sugar cookies, and they're so much better than store-bought. You can eat them on their own or smash them up to make an absoultely incredible graham cracker crust (we used some of these in a crust for peppermint cheesecake - so good!). I bet these would make killer s'mores as well, though I haven't tried it. Be sure to try and get the cookies as thin as possible when rolling them out to keep the graham crackers crunchy. 1. Whisk together the flours, 1/4 cup sugar, salt, baking powder, and baking soda. Sprinkle over the butter and cut into the dry ingredients (or pulse together in a food processor). 2. In a small bowl, whisk together the milk, honey, and vanilla. Drizzle over the flour-butter mixture, and stir to combine. Add more milk if needed so that the dough comes together into a single mass. 3. Shape the dough into a disk, wrap in plastic, and chill until firm but still flexible enough to roll out, 20-30 minutes. 4. Preheat the oven to 350 degrees. Roll the dough out between two sheets of parchment paper until it is 1/8-inch thick. Peel off the top sheet of parchment and place on a cookie sheet. Prick the dough all over with a fork and score into squares or any other shape you like with a sharp knife. 5. Bake 20-25 minutes until golden brown. Cool, and then break graham crackers along the score lines. Cool before storing. Cookies can be kept air-tight for at least 3 weeks.